This case of Tula 7.62x39 ammo contains 1,000 rounds of 124 grain hollow point projectiles sitting on top of berdan-primed steel cases. This ammo is well suited with your AK-47 or SKS and to ensure smooth feeding the steel cases are coated with a polymer coating to reduce friction. 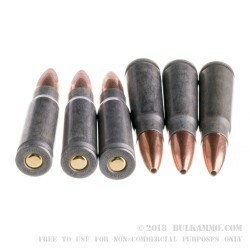 To help keep the cost of the ammo as low as possible the Russian manufacturers typically make their bullet jackets with bi-metal bullets which contain steel with a copper wash and this ammo is no exception. This metal clad bullet creates a durable, strong projectile jacket at a competitive price due to steel's affordability relative to copper. 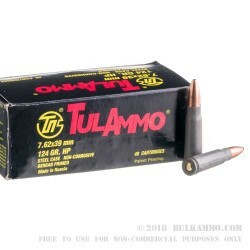 This ammo comes packaged with 25 boxes including 40 rounds each. Practicing with your firearm is a very important part of your craft and Tula understands this and does all it can do to keep the cost of shooting as low as possible.